Nevada Boasts K-2 National Champ! Up against tough competition from schools with a long tradition for playing the game, nine pupils from The Meadows School held their own at the U.S. Chess Federation 2005 National K-12/Collegiate Championship Dec. 2-4 in Houston.The five-member second-grade team finished second in the nation for its grade level, in a field that boasted 21 teams. In the team competition, the three highest scores determine the team’s score. The Southern Nevada team finished a half-point behind the 11-member second-grade team from New York City’s Dalton School, where Josh Waitzkin was once a student. Waitzkin’s journey to his first national championship was portrayed in the 1993 movie “Searching for Bobby Fischer.” The Meadows team also finished ahead of Hunter College Elementary School in New York, which offers a chess course as part of its curriculum. The second-grade team members are Michael Baldyga, Alex Agrawal, Parker Sachs, Beau Capanna and Asia Thomas. In addition to the second-grade team trophy, several other pupils from The Meadows School achieved individual accomplishments at the tournament. The individual competition consisted of each player competing in seven rounds, one game per round. Michael Baldyga, 8, won the second-grade championship, which had 116 entrants. 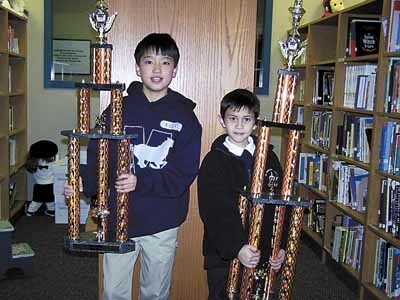 He was the first pupil from The Meadows School to win a national title in chess since Patrick Hummel won his fifth straight championship in 1999. Michael’s brother, Alexander, also finished first in the under 1,000 (points) kindergarten level and 12th in the nation in the overall kindergarten level. Alex Agrawal also did well in the second-grade level, tying for 11th in the nation. Richard Lee, 12, tied for second in the sixth-grade level competition, which had 166 players. The Lees thought their son might be interested in chess because it would be a challenge. Michael has been playing chess for almost three years, ever since Christina and Mark Baldyga signed him up for the chess program at The Meadows School. In addition to their coaching sessions with Conver, both Michael and Richard play chess against adults with the Clark County Chess Club that meets at University Medical Center. “Richard has been playing there for eight or nine months, and he is not intimidated,” his father said. Richard enjoys playing against the adult chess players in the club. “It’s fun because sometimes I beat them, and they’re better than me,” Richard said. He will compete in the North American Open tournament at Bally’s at the end of this month. Michael’s mother believes he also has benefited from the experience against adult players. “The time playing with the adults has taught him to take his time and think of his strategies,” Christina said. Other Meadows School pupils who participated in the tournament were Cameron Brown, who competed in the seventh-grade level, and Kathryn Gibson, who competed in the fourth-grade level. During the summer, hundreds of children benefited from chess lessons as part of the Inner-City Games of Greater Las Vegas. Qualification tournaments were held at three schools and t-shirts were awarded to the winners.At the end of July, the finals were held at Rancho High School. 120 children showed up and medals were awarded to the top three players. The Chess Jester (Brad Zentmyer) provided entertainment. Many parents watched and the event was covered by the local papers and television stations. Special thanks to Greater Las Vegas Inner-City Games and Executive Director Jack Mannion and the staff. Congratulations to Philip Wang (age 17, rating 2325) of Reno and Patrick Hummel (age 16, rating 2410) of Las Vegas on qualifying for the 2001 Pressman All-America Chess Team sponsored by the Pressman Toy Corporation of New York, NY. The U.S. Chess Federation has announced the names of the junior players who have qualified for the 2001 Pressman All-America Chess Team. The 25 players on this year’s team have met age and rating criteria that place them in the top one percent of more than 46,000 of their fellow scholastic and youth members. The Pressman Toy Corp., of New York, N.Y, sponsors the Pressman All-America Chess Team each year. This year marks the ninth consecutive year of corporate sponsorship for the annual team contest. Each team member will receive an official 2001 Pressman All-America Chess Team jacket, plus a special Certificate of Achievement. Congratulations to Philip Wang (age 16, rating 2323) of Reno and Patrick Hummel (age 15, rating 2455) of Las Vegas on qualifying for the 2000 Pressman All-America Chess Team sponsored by the Pressman Toy Corporation of New York, NY. The U.S. Chess Federation has announced the names of the junior players who have qualified for the 2000 Pressman All-America Chess Team. The 27 players on this year’s team have met age and rating criteria that place them in the top one percent of more than 43,000 of their fellow scholastic members. The Pressman Toy Corp., of New York, N.Y, sponsors the Pressman All-America Chess Team each year. This year marks the eighth consecutive year of corporate sponsorship for the annual team contest. Each team member will receive an official 2000 Pressman All-America Chess Team jacket, plus a special Certificate of Achievement. Andrei Zaremba and Steven Winer tied for first place honors at the 1999 Denker Tournament of High School Champions, held Aug. 15-19 in Reno, Nevada. Zaremba, 17, of Dearborn Heights, Michigan and Steven Winer, 18, of Burlington, Vermont each finished with 4 1/2 out of a possible 5 points. Each player qualified for a $375 scholarship. Patrick Hummel, 15, of Las Vegas, Nevada scored 4 points to finish in third place and also qualified for a $150 scholarship. The remaining prize winners were Marcel Martinez, 19, of Hialeah, Florida, Vinay Bhat, 15, of San Jose, California, David C. John, 16, of Houston, Texas, Joan Santana, 17, of Teaneck, New Jersey and Riley Yates-Doerr, 18, of Seattle, Washington each with 3 1/2 points. A total of 34 players competed in the event. The four-year scholarship to the University of Texas at Dallas (UTD) was awarded to Zaremba as the highest finishing 11th grader or below. This year UTD added a scholarship for the girl in 11th grade or below with the highest score. Karen Birkendalh of Salt Lake City, Utah won that honor with 2 points. The Denker Tournament of High School Champions is open each year to the reigning high school chess champion of each state. Players must meet age and grade requirements, and be certified by their local state federation. The event was co-sponsored by Grandmaster Arnold Denker (through the Chess-in-the-Schools program based in New York City), the U.S. Chess Trust and the U.S. Chess Federation. Philip Wang (2243) of Reno, Nevada, with 6.5 points out of 9, tied with nine other players for the best Under 2300 score in the tournament. Round one Win against a 1719. Round two Win against a 1937. Round three Draw against a 2662 (GM Joel Benjamin). Round four Lost against a 2588. Round five Win against a 1997. Round six Draw against a 2105. Round seven Win against a 2047. Round eight Win against a 2400. Round nine Draw against a 2361. Note: for those sharp-eyed readers who noticed that Philip’s rating is given as 2243 at the top and 2242 in the Round 8 game score … it is 2242 in June Rating Supplement which is what was used at the beginning of the tournament, but it is 2243 in the current (August) Rating Supplement.